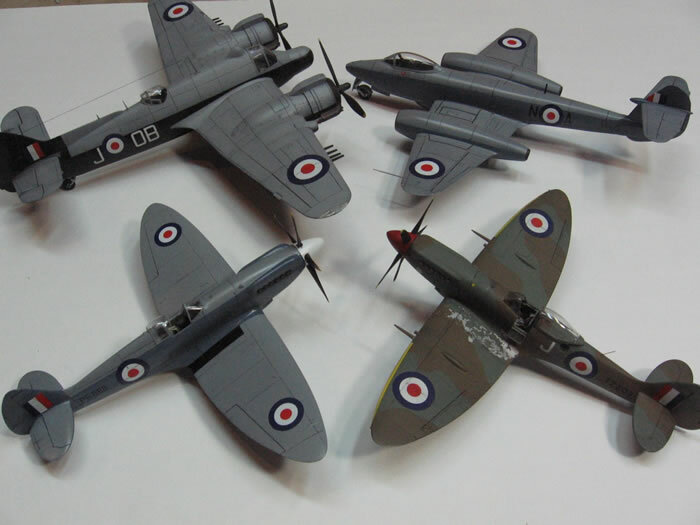 How do we as modelers choose what model to build? In my case, a build generally starts with a particular aircraft of interest-the more obscure the better-and I see if a kit and time exists to get it on my shelf. 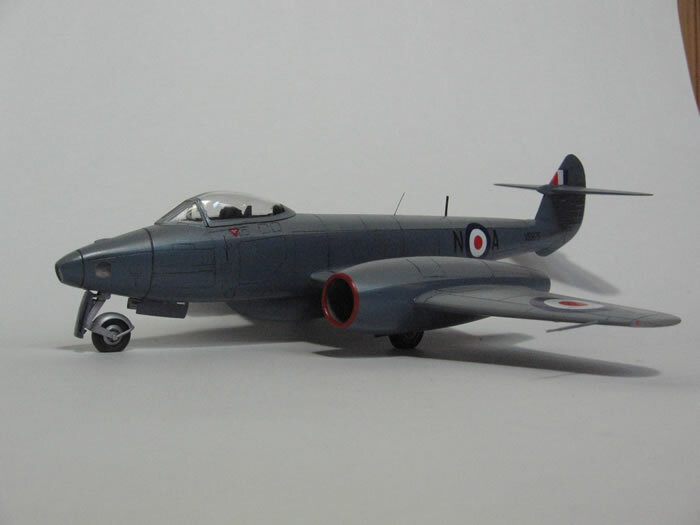 In the case of a particularly obscure, unkitted Meteor, it was an unrepentant case of love at first sight! 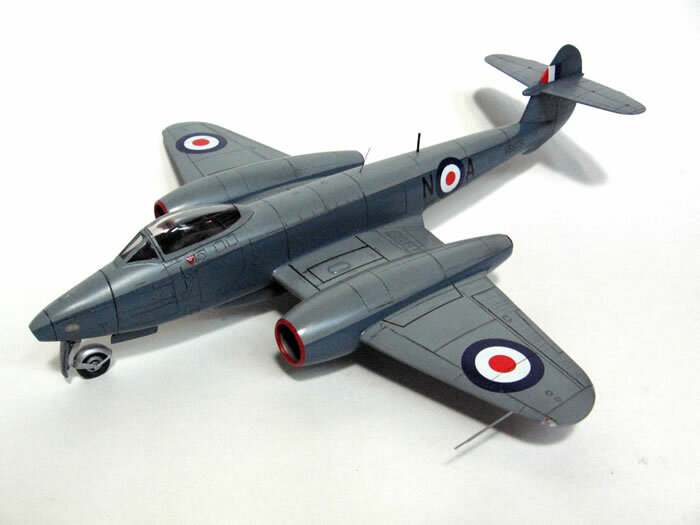 Having purchased a set of Freightdog Models decals for a Spitfire project, I came across a blue/grey vixen of a Meteor that I could not put out of my head. 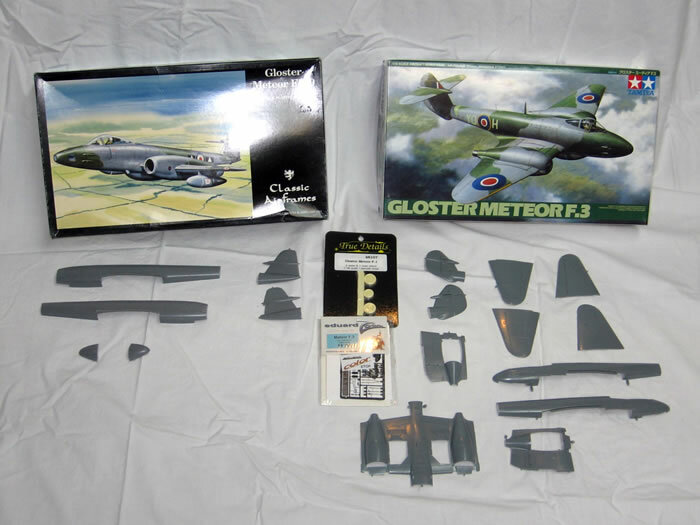 Having no real interest in the Gloster Meteor, I did not have any unbuilt kits waiting in my queue, but with perseverance an elusive Classic Airframes FR Mk 9 kit and Tamiya Mk IV kit were procured. Starting this build was nontraditional in that I began by making all of the necessary cuts to both the Classic Airframes (CA) and Tamiya kits to make the conversion from an FR Mk 8 to a PR Mk 10 first. I was concerned that the Tamiya and CA kits might be too dissimilar for this conversion to work, and I did not want to waste a lot of construction time only to toss the mess into the someday locker. Fortunately, all of the cutting was accomplished without incident. The cross sections of the two kits were not a match at the tail and I had to put some thought into how to solve the problem. However, the fix was simple: I taped the fuselage halves and tail halves together and measured the difference (the step). Using a black marker on the top and bottom of the fuselage, I marked the ¾ mm that needed to be removed from each fuselage half, top and bottom and sanded a taper from the cut at the rear to near the cockpit opening in order to narrow the CA fuselage to match the Tamiya tail section, effectively removing any step between the sections. Satisfied that the most visible part of the conversion was going to work, I began painting the resin cockpit parts and engine fronts Floquil engine black. Lacking inspiration for detailing the cockpit, I began to clean and assemble another perceived problem area, the wing center section. Having looked over the two kits, I decided to use the Tamiya landing gear as I felt it had better detail. 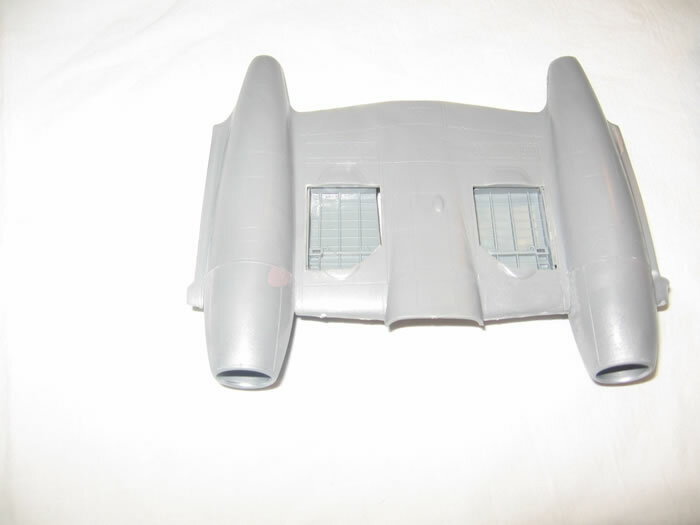 As a result of that decision I also cutout and modified the Tamiya wheel bays for the CA wing section. This required extensive scraping and sanding to thin the deeper Tamiya parts to fit (a lot like the CA kits of old!). 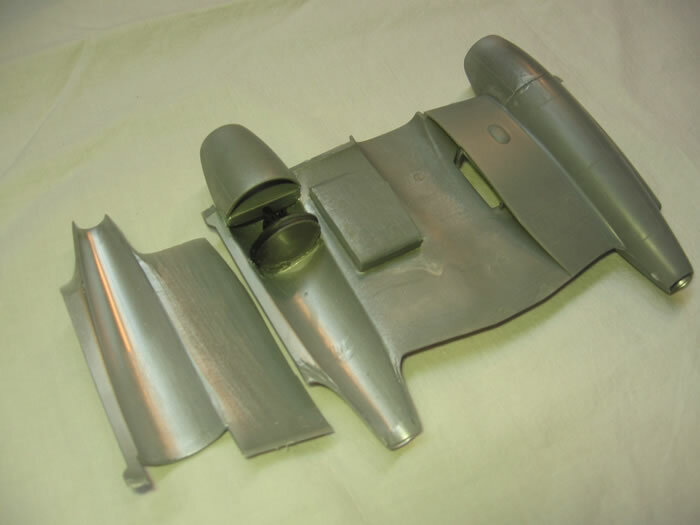 Next I assembled the large intakes and front wing spar pieces, using some filler and primer to get them smooth, and mated them to the lower center wing section being careful to mind that the fit was good. Checking that the top wing sections would fit without gaps, I airbrushed a coat of Floquil old silver on to all of the intake components and attached the top wing panels using ca glue for strength. Needing to assemble the fuselage, I began painting and assembling the cockpit. The ejection seat was painted first following the kit instructions and best guesses from the few cockpit photographs that I have, and then given a dry brush with pastels for contrast and weathering. Next I detail painted the cockpit side walls, floor, and back wall giving each a dry brush with dark grey paint as well as pastels. Beginning assembly of the resin cockpit parts required minor trimming as the back wall was wider than the floor. Once glued up, I tried a test fit into the taped up fuselage and discovered two problems: first, the tub assembly did not fit; it was too wide, and second I had attached the front bulkhead in the wrong place. Upon inspection it was apparent that the cockpit tub would not sit high enough in the fuselage to allow the nose gear bay molded on the bottom of the cockpit floor to meet with the lower fuselage. Rather than risk disassembling the rather fragile resin cockpit parts, I opted for an aggressive regiment of scraping to thin the fuselage plastic. I did, however, need to remove the front bulkhead which promptly broke and split the flimsy nose gear attachment into multiple pieces. Patience and judicious ca glue saved the day. Now that I had a decent fit with the cockpit I felt it prudent to check the photo nose section to fuselage fit before committing the fuselage and cockpit to each other. 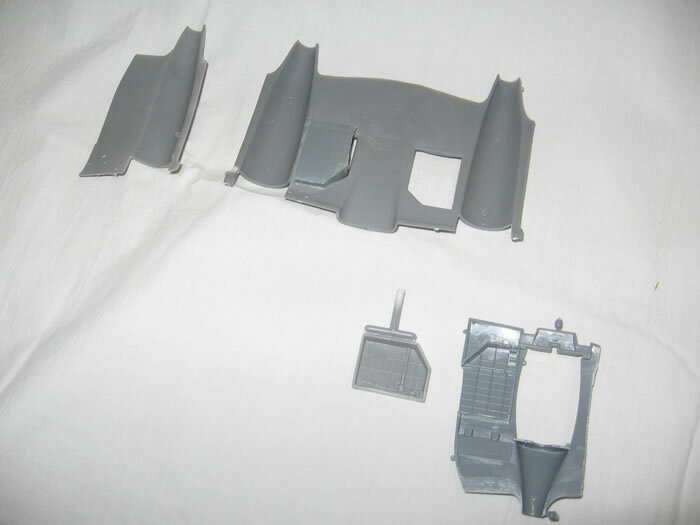 Unfortunately, the finely molded clear parts included to build the pr version are smaller in cross section than the fuselage resulting in a large step and I was forced to sand the forward fuselage in a similar manner to what I did to the rear of the fuselage… making the fuselage even narrower for the cockpit tub-gads! Continued fussing resulted in all the parts fitting well and I glued up the fuselage with Tenax liquid cement, and attached the nose. Before fitting the cockpit tub I decided to try and make the camera compartment more realistic as CA provides nothing to detail this are. Use sources I built a camera bay floor and aft bulkhead, some small camera apertures and promptly created serious fit problems for the cockpit tub again! Trimming and fiddling eventually resulted in the nose separating from the fuselage, allowing access for a more determined scraping to allow things to fit properly. With the cockpit tub/camera bay now able to fit properly, I reattached the nose which required a considerable amount of filler to correct, permanently attached the cockpit tub and added the large metal weight that Tamiya included into the empty space just behind the cockpit tub. With the fuselage assembled it was time to consider how I was going attach the tail section. I created a fuselage plug using a leftover resin radar nose cone appropriately shaped to fit the dissimilar wall thicknesses of the two kits. Satisfied that a great fit could be achieved I began working on the wings so that I could attach them prior to the tail to ensure that everything lined up correctly. Using donor resin wing tips and evergreen plastic I was able to create a reliable and strong mating surface to attach the outer wing panels. Watching closely the fit and angles, I used ca glue to attach and fill the gaps. At this time I also sanded all of the remaining seams in the wing assembly and fuselage, mounted the panel behind the ejection seat and attached the wing assembly to the fuselage. Ready to attach the tail section I glued on the Tamiya horizontal stabilizers and using a carpenters square to ensure a 90 degree relationship to the wings I ca glued the tail onto the fuselage. 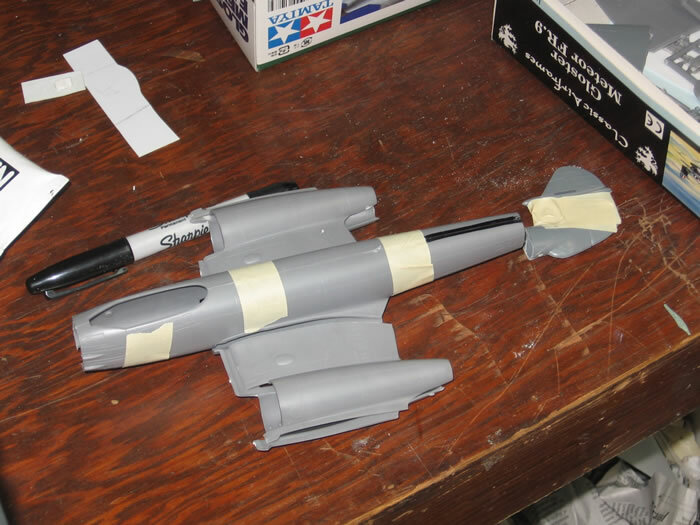 The model was now looking very much like a pr mk10 Meteor, and I moved onto priming, sanding, and scribing in preparation for paint. 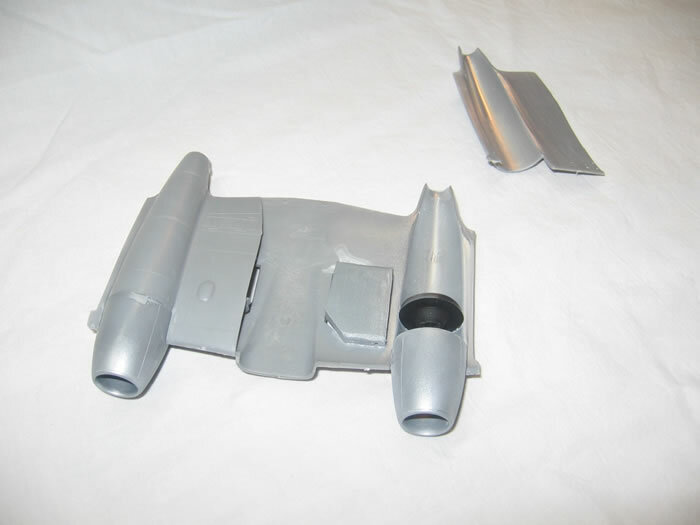 Having taken care with the assembly, the only areas that needed filler were the troublesome nose and the lower wing to fuselage joints, and these were soon rubbed out and primer applied. After a thorough sanding with 400 grit I touched up the panel lines and drilled the lens ports in the lower aft fuselage. At this time I also installed the lower fuel tank; unfortunately, 4 mm to far forward. I can live with it but I cannot figure out how I missed all of the landmarks and attached it so far forward. Nearing the paint shop, I endeavored to install the forward canopy section, install the instrument panel, seat, and stick; unfortunately, the instrument panel was not going to go in as planned-I should have painted and attached it when the tub was installed-nuts! Looking over the etched Eduard set that came with the Tamiya kit, I realized a solution through judicious bending of a pre-painted brass panel. Painting began with a wipe down and pre shading of panel lines. Using Testor's Model Master Enamels I began with the lighter topside shade of medium sea grey. Once dry I masked off the top surfaces and installed the CA gear doors and sprayed the remainder of the model with PR blue. Letting things sit for a few hours I cleaned up mold lines on the Tamiya landing gear and painted both the gear legs and resin True Details wheel hubs with Floquil old silver. Unmasking the model revealed no major bleed through and the whole thing was given a coat of lacquer gloss clear in preparation for decals. The decals went on perfectly and laid down very well with an application of Micro-Sol. I managed to fold over the second set of under wing call numbers, forcing me to ‘cheat’ letters and numbers from the spare decal bin-not right, but I can live with it. After another coat of gloss lacquer I installed the landing gear, gear doors, and antenna. The camera ports were given covers using Micro Crystal Kleer and the conversion was finished. 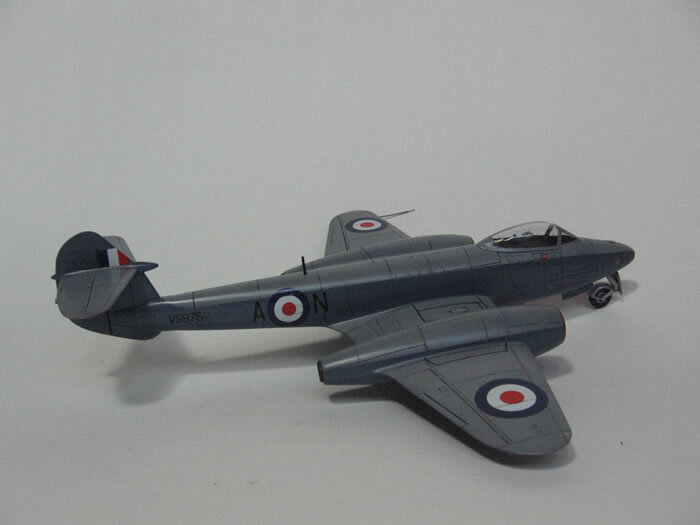 What an awesome looking model-the rake of the landing gear is a nice change from all the tail-sitters on my shelf and the model looks just right. 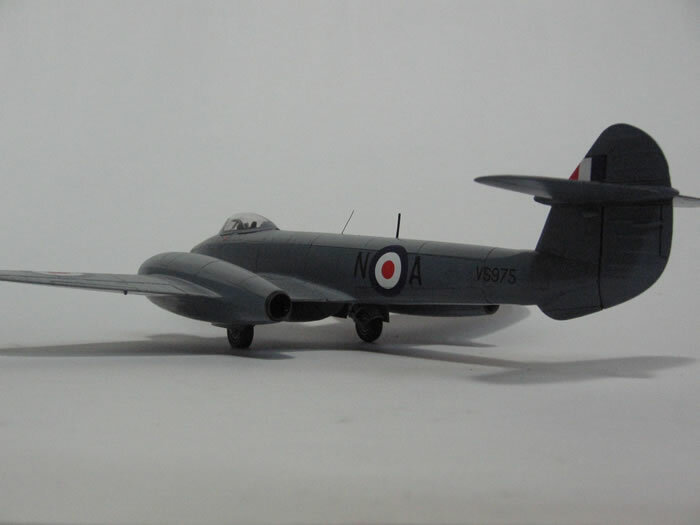 Overall the conversion was very straight forward, and although requiring some pre planning and modeling skills, it is not beyond the average modeler. 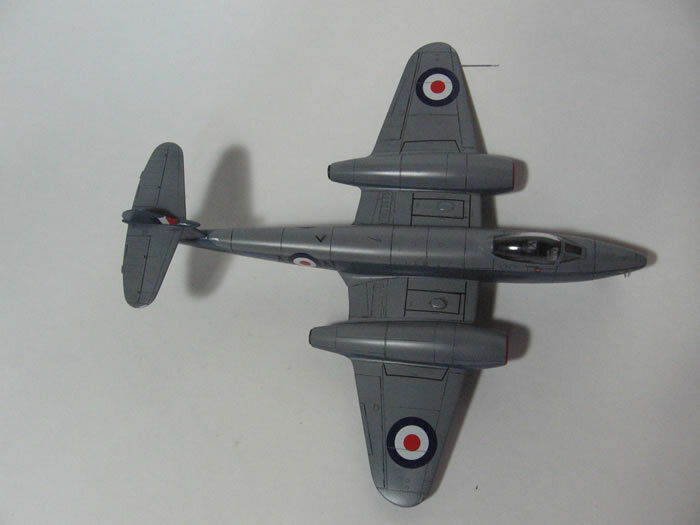 Both the Classic Airframes and Tamiya kits are well engineered and despite some fit issues in the nose area of the Classic Airframes kit went together very well indeed. Best of all, I have a unique postwar jet in my collection!